Please ensure you are purchasing the correct thinners for your application. It is important that only the recommended Thinners are used for each application, failure to do so will result in a ruined job. Substituting other proprietary products will also result in failure. Several products have a choice of Thinners depending on the application method to be used. As a general rule, thinning should be kept at a minimum as the quality of the paint work will suffer from too liberal thinning. However, if application is to take place at high temperatures (air and/or steel), thinning may even beyond the limits mentioned on the data sheets exceptionally be necessary in order to avoid dry spray and poor film formation. Hempel paint is produced and supplied in such a way that thinning is normally not necessary provided the paint is properly mixed/stirred. 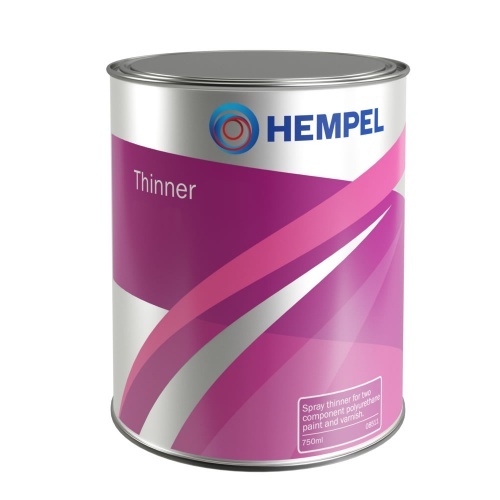 However, if the paint is to be applied in a low film thickness (for instance as a "sealer coat") or if the paint has become too thick, e.g.. in cold weather, the HEMPEL THINNER(s) indicated on the product data sheet may be added to obtain a consistency most suitable for application. stand the kind of solvent you are using and be careful with any plastic containers you may be using. Do not pour thinners away into drainage systems but use the facilities available for this purpose.